Pet Shopper is pleased to announce that it has been chosen to be one of the first UK stockist's of Carnilove Pet Foods. 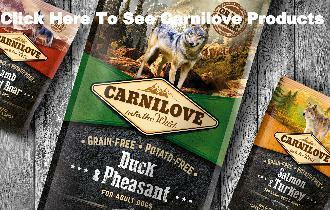 Carnilove wet and dry dog food – created with respect for the historical continuity of the cohabitation of man and dog. The relationship between humans and dogs can be dated to approximately 12,000 BC, over the course of which the dog adapted the composition of its diet to resemble that of humans; however, with the advent of agriculture, the human diet moved further and further away from food suited to the dog’s anatomical and genetic predisposition. Carnilove's priority is the dog’s health and physical condition. The wide spectrum of carefully selected meat, that would have been traditionally obtained in the wild, such as elk, duck, pheasant, lamb, wild boar, and salmon, corresponds to the composition of naturally hunted prey and ensures the required intake of important amino acids. Forest fruits, vegetables, wild berries, and herbs provide necessary natural vitamins, antioxidants, and other essential nutrients. The ingredients and their ratio in the formulas match the diet of dogs prior to the advent of agriculture, but the products are manufactured using the latest methods and technologies. Carnilove is a superpremium dog food with a unique formula highly-efficient antioxidants in the form of fruit extracts. The natural composition of Carnilove is completely free of grain, a source of empty calories. In simple terms, Carnilove is designed to meet a dog’s natural nutritional requirements with a view to their biological origin and anatomical disposition. The philosophy underlying the Carnilove (carnos – meat, love) pet food returns to the natural foundation of canine nutrition, while maintaining modern dog feeding trends. Dog food know-how lies in the parallel with natural dog nutrition, with approximately a 70% share of ingredients of animal origin and a 30% share of ingredients of vegetable origin. The highly digestible proteins and other important nutrients contribute to a dog’s vital condition. Apart from the high content of proteins, Carnilove also contains natural antioxidants (cranberry, pomegranate and grape extracts) strengthening the immune system. Thanks to its “one protein” composition (utilizing only one source of animal proteins), Carnilove may help solve food intolerances. Carnilove is suitable for all adult and active dogs that can utilize energy from animal sources efficiently, such as breeds typically used in sports, hunting or rescue and working dogs. The pet food, which is primarily derived from animal resources, also agrees with sturdy framed breeds (such as molossers and bulls) requiring the chondroprotective agent content to support healthy joints and cartilage. Its optimal 70:30 ratio of animal proteins to fruit and vegetables, and its taste attractiveness and ideal content of efficient additives (such as vitamins, microelements or antioxidants) based on the latest knowledge of nutrient requirements for dogs, all contribute to making Carnilove pet food the natural dog nutrition choice.